Sunset Beach is a breathtaking, beautiful 4.5-star luxury beachfront resort in Cabo San Lucas, Mexico with every amenity under the sun... and year-round sunshine! Very close to all of the nightlife and fun in the sun, but worlds apart in its own gated paradise! ONE (1) BEDROOM, TWO (2) BATH EXECUTIVE SUITE WITH OCEAN VIEW! *** If you are looking for a larger/smaller unit (or multiple units), just ask me or check out any of my other units at the same resort listed here under listing numbers: 352347, 351954 & 63189. * Note: GREAT WEEKS are pre-reserved for your convenience! Enjoy the privilege of playing the spectacular new QUIVIRA GOLF COURSE -- designed by Jack Nicklaus himself -- opened in late 2014 and available ONLY to guests staying at one of the Pueblo Bonito resorts in Cabo!!! In most cases, the room number/location will be assigned upon check-in, just like any typical hotel reservation (special requests accepted, but not guaranteed), but you will get an ocean view room. EXECUTIVE SUITE (Sleeps 6; 1 bedroom/2 bath) is a single story unit with a spacious furnished balcony/patio, kitchen (with stove & microwave, but no oven), living room and dining area. The bedroom is completely private -- with a door separating it from the living room. It has two full size beds OR one king size bed by request, plus a sofabed in the living room. Housekeeping can push the two beds together and make them up as one giant king, if you like. The 1,400 square foot Executive Suite (total including terrace) is twice the size of the Junior Suite! It has a bathtub and separate shower in the master bathroom and another shower in the second bathroom. The RESORT'S LOWEST PUBLISHED PRICE off season is $501/night, which comes to $3,511/week. Their rates are much higher during peak season (especially between Christmas Eve and New Year's Day). If you rent from them, they will also charge you extra guest fees for more than 2 guests staying in the suite, but not with my rentals. Rent from me and SAVE $1,000s! The all inclusive meal plan is optional and would be payable directly to the resort after the reservation is officially transferred into your name. They require a minimum purchase of 3 consecutive days, and it must cover all guests staying in the same unit. Their current discounted rates for purchasing the all inclusive for 7 nights and paying prior to your arrival date are roughly $85/night per adult, $70/night for juniors age 12-17 (or seniors 60+), $40/night for kids age 5-11 and free for toddlers age 0-4. Rates may be higher for less than 7 nights and much higher if you wait until check-in to purchase. Even if you choose not to purchase the all inclusive, you can still use your credit card (or room charge) for all of the resort restaurants, bars and room service. In addition, there are lots of great affordable restaurants, bars and nightclubs in downtown Cabo, just a 5 minute cab ride from the resort! WiFi service is included free with the all inclusive option, otherwise it costs $12/day or $6/day paid prior to arrival. WiFi packages cover up to 4 devices connected at a time. Accommodations include: Central A/C, flat panel HDTV (upgraded in 2013) with satellite reception, and fully appointed kitchen (with stove & microwave, but no oven). The furniture is all made of beautiful Mahogany wood, and the decor is beautifully appointed in stonework with natural earth tones. The suite includes free twice daily maid service. 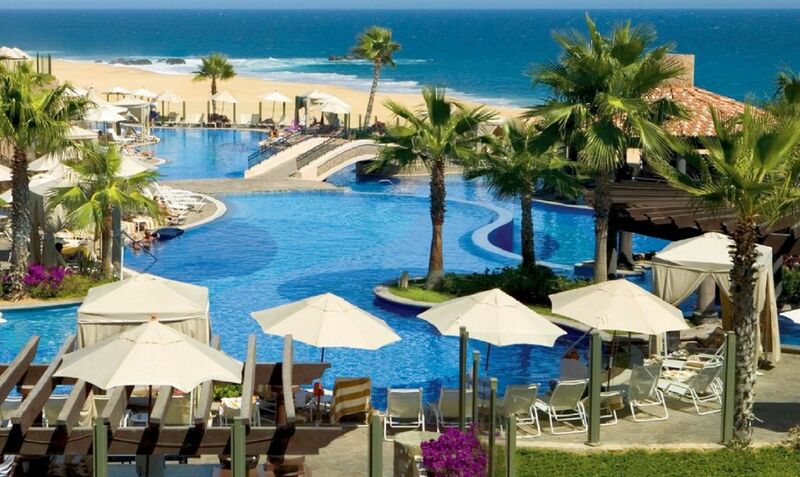 Guests are provided with full access and room charging privileges at four Pueblo Bonito resorts in Cabo (Rose, Blanco/Los Cabos, Pacifica and Sunset Beach). Pueblo Bonito even provides free Mercedes bus shuttle services between their resorts, so it's only a 15 minute shuttle ride or a 10 minute taxi ride to the perfect location for water sports and swimming in the Sea of Cortez! The resort offers every upscale amenity imaginable, including 24-hour room service, a pillow menu, and much more!!! Free 24/7 golf carts will chauffeur you door-to-door anywhere around Sunset Beach. You'll have access to miles of private beaches and Sunset Beach's 16,000 square foot European spa & fitness center, as well as all the other amenities and restaurants at the 5-star Sunset Beach Resort & Spa. There is a mini-market and a deli right onsite for stocking your kitchen with food and beverages. For larger food purchases, you are only 10-15 minutes drive from the nearest Costco or City Club (no membership required) big box retailers. The resort offers a full ($32) or half day ($22) Kids Club (ages 4-11) with arts & crafts, games, pool activities, movies and more -- plus optional 24 hour babysitting services -- so adults can really enjoy themselves in peace and quiet while soaking up the beauty and opulence of this exquisite resort and spa! Sunset Beach is only 10 minutes drive or a free 15 minute Mercedes bus shuttle ride to the calm swimming waters and watersports available at Medano Beach (on the Sea of Cortez) and the adjacent marina -- walking distance from downtown's famous nightclubs: Cabo Wabo, Hard Rock Cafe, The Giggling Marlin, and El Squid Roe! At the Medano Beach sister properties (Rose & Blanco), you can enjoy exclusive access to the private Pueblo Bonito roped-off section on the sand with chaise lounge chairs, cabanas and full waiter service -- and you can even charge your food & drinks to your room back at Sunset Beach! If you are concerned about the need to cancel your reservation or would like coverage for medical treatment or evacuation, lost or delayed luggage, missed flights and more, I recommend affordable vacation rental insurance from Travel Guard (a subsidiary of AIG). The pools... the views... the architecture... the lobby... the suites... the location! Everything is magnificent! This resort is heaven on earth. The pool areas are spacious and magnificent, and the onsite restaurants offer plenty of tasty options for every taste. This secure gated resort is quiet, safe and exclusive -- without all of the noise and crowds like Medano Beach. Plus, the staff at Sunset Beach are wonderful, and the resort is conveniently located just a mile or two (5-10 minutes by taxi) from all the nightlife and watersports around downtown Cabo! The resort is exclusive, quiet and beautiful, but only 5 minutes from downtown. Guests have full access and shuttles to all four Pueblo Bonito resorts in Cabo, including two resorts in the heart of Medano Beach. Sunset Beach has six separate pool areas, each more spectacular than the rest, with multi-level freeform pools and swim-up bars, poolside dining, Jacuzzis, and a beachside hydrotherapy pool. The resort offers 24 hour dining, tennis, spa services, a fitness center, sand volleyball, ping pong, and a full day kids club. Everything the discriminating traveler requires -- with or without children. The lobby is magnificent and includes a full time concierge desk for assistance with everything from restaurant reservations to golf, fishing, watersports, or land activities. There is even an onsite mini market, internet cafe, deli and chapel. For late night trips to the nightclubs in downtown Cabo, it's only $14 per car for a taxi ride to or from the resort! It's the best of both worlds: tranquil and beautiful at the resort, but just a short distance to all of the fun and activities around downtown and Medano Beach! Free unlimited use of fitness center for all timeshare guests (regularly $15/day per person). My family and I had a fabulous time at Pueblo Bonito Sunset. The location was perfect. Sunset Beach is 5 star. Relaxing and beautiful. The shuttle was great when we wanted to go to the other resorts closer to town. Our unit was comfortable and everything went smoothly. Will definitely go back. We had a great stay! The suite was exactly what we were looking for and we enjoyed all of the pools and food that resort had to offer. Sunset Beach is a beautiful, well-maintained resort. There have been many recent improvements and additions. Jeff Argon is a pleasure to rent from. We stayed in one of the executive suites for a girls’ weekend - there were 6 of us and we had plenty of space and everything we needed. Everything was perfect, from the floor to ceiling ocean views from our large balcony off the main room and bedroom, to the two spacious bathrooms, a good-sized kitchen area with the nessary cooking and eating supplies, and all of the services provided at the resort. We thought they did a great job providing transportation via golf carts around the property - you can just call for a lift anywhere you are on the resort and they are waiting outside your building/ pool/ beach within minutes. The main lobby always had a queue of cabs ready to bring you anywhere off the resort (always felt very safe with the arrangements provided by the hotel staff), and downtown was just 5 minutes away. It felt like we were getting the best of both worlds with this VRBO - the safety and accommodations of a reputable resort including great food options and pool/beach access (and daily maid service if needed) combined with with the space and flexibility of a vrbo home rental. We saw lots of other hotels / resorts in the downtown area and felt like we had chosen the best location and value with Pueblo Bonita. Jeff was awesome to rent from and provided lots of helpful information up front. This was our first time in Cabo and we really loved the experience here and would certainly love to come back and stay at one of Jeff’s properties again. Highly recommend! Bonito Sunset Beach was a perfect choice for our family. It is as nice or nicer than advertised. Our suite was spacious and the views were fantastic. The Sky Pool is outstanding but we truly enjoyed all of the pools. The Market Place is great and had something for everyone. We were there after Christmas through New Years and due to its size, the property never felt overly crowded. The only comment we'd have is that the shuttle to the 'sister' resorts books very early in the day so it tough to be spur of the moment if you want to take advantage of it. A taxi was about $14.00. Jeff was so helpful before our trip. He was quick with replying to all my emails and answered all my questions in detail. We were able to do Premium-All inclusive through the resort and got 51% off! This came around to $50 pp for RT shuttle rides and $77/day for food and drinks. We were easily able to fit 6 girls in the room and had more space than we needed! This is a timeshare. While the amenities and features will be the same, you may not get the exact unit shown in the photos. No taxes or per person fees. Free daily maid service. Weekly rates are cheapest (5-7 nights is the same price, so select a 7 night stay for the lowest nightly rate).